My Dublin Life: GOT THE JOB!!!! I don't need anyone to tell me how lucky I am right now to be able to tell everyone my news: I have found a job. I will be staying in Ireland for at least another year. As my mother told me mournfully, working for minimum wage in a restaurant kitchen isn't why she and Dad put me through college. But it's just for a while, and I'm looking forward to it. Training to be a teacher right now when I'm not sure I even want to be a teacher doesn't make sense. Totally psyched. My personal victory is the fact that over the last month or so I've gone from someone who can't cook to someone who can, at least a little bit. I'm going to be a very humble member of staff and I don't know that they'll actually be letting me at the oven but still: very happy. The thought of leaving Dublin was really distressing me, badly. I think I'm even beginning to sound like an Irish person and I'm absolutely not ready to leave. I've signed a lease with the landlord committing to another year so it's serious! Dublin is fantastic in the summer, so I'm also happy to be here for all that's going on, and now I think I'll feel as though I'm attending as a local. Last year, fr'instance, I didn't go to the Maritime Festival, which is on in a week or so, so I don't really know what it involves, although I'm hoping for deck-swabbing, grog-downing and stuff like that. I really like the Docklands area, where it's on. There are a lot of impressive, shiny, new buildings that are a cool counterpoint to all the history that's going on downtown. Speaking of history, last night I was at my first Irish wedding; I was a bit of a gatecrasher, because I was invited at the last minute. What a cute couple they were, too. 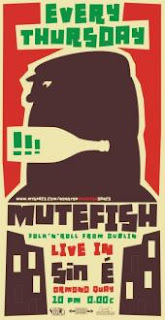 A band called Mute Fish, which I'd seen before on Grafton Street, provided the music. AMAZING!!!!! Where does history come in? Well, the hotel in Ballsbridge, a big Victorian Gothic sort of affair (my favourite architecture -- it was just lacking a few gargoyles to be absolutely perfect) used to be a Masonic school for girls! How odd is that? There were Masonic symbols everywhere, in the mosaics, in the stained glass windows ... most peculiar. Very nice hotel, though. In a future life when I actually have money to spend, I'll go there for a night. I'm curious to see if there are masonic symbols on the bedroom ceilings, too. Do you have any pictures of the wedding? There's nothing like a good Irish knees-up! I was a pupil at the Masonic Girls School for 6 years until shortly before it closed! I'm afraid you'll see little evidence of the original bedrooms (dormitories that slept about 12 - 24 girls) as that part of the school has been totally altered internally. That beautiful hall where you would have had the wedding used to have wonderful stained glass windows and a number of very large portraits of important freemasons around the wall. We used the hall for 'prayers' (a little service) each morning and for prep (homework)each night, sewing/mending, listening to music, dances with boys from the Boys School, Prizegiving and I can't remember what else. There was a separate Gym out the back of the school for physical activities. Hi Anonymous! Wow -- I hadn't realised the school was open so recently. Do you have any photos? I could post them up here -- wouldn't that be fun?